I have to mention first off my Irresistible Me Jade Brush,* like I said in my review a few posts ago it is a ceramic straightening brush. Trying to pack light is so hard when you have to pack a brush and straighteners so this is perfect. You can read my full review but it is so easy to use and so lightweight, it will and is a travel essential! To help keep my straighten hair in place I take this mini Tony & Guy Hairspray, it is amazing to set my hair and keep it in place, but it is a perfect size. I just love picking up minis for my holidays, I am nearly finished this so I might have to pick the full version up! Sticking with hair products, I have to take these mini bottles of my favourite shampoo and conditioner. 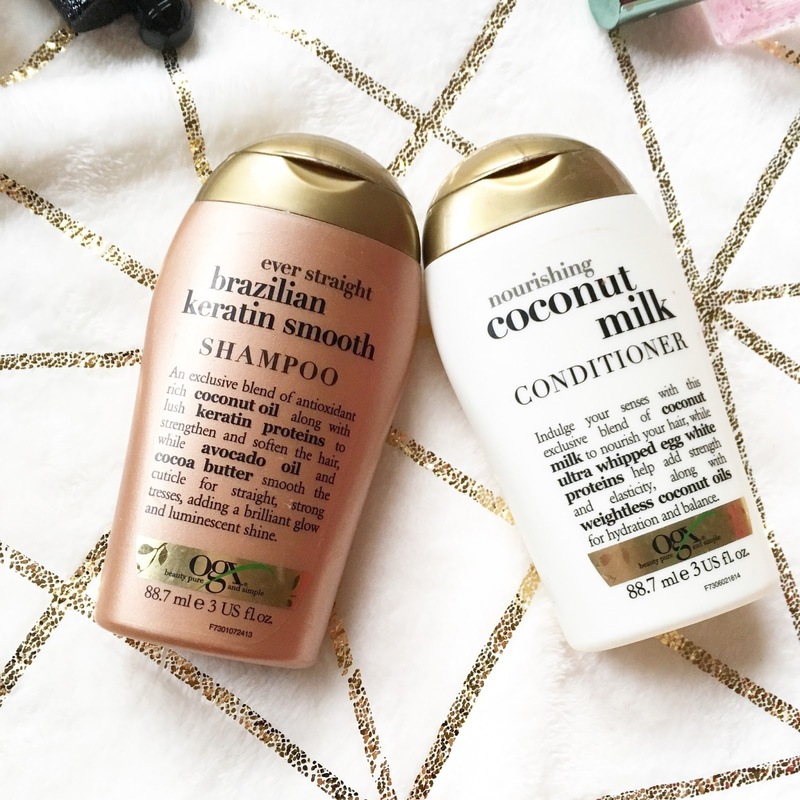 I have talked about my love for OGX hair products before, they work wonders on my hair. The few times I have been away I haven't used them but they don't weigh much and it's always handy to keep both in my bag! Skin-wise, I take the cutest minis of the Emma Hardie Moringa Cleansing Balm and the Liz Earle Instant Skin Tonic! Just look at how cute they are tho, they are just replicas of the big thing and that makes me happy! I actually keep filling up my Emma Hardie tub (not sure how hygienic that is) as the full-size tub is pretty big and would weigh a lot. These are both a staple in my skin care routine so I have to take them with me!! Lastly, mini perfumes! I think this is what gets me excited the most, I just love mini perfumes/mists! I obviously have to take my Zoella Beauty minis with me, I have been loving 'Let's Spritz' lately. I also bought mini YSL perfumes last year at Duty-Free so they are just perfect if I want a stronger scent! Black Opium has to be my favourite!! I lastly take, my mini Victoria Secret perfumes, I have a slight obsessed with VS and I love the scents they have so (sneak peak at my haul) I had to buy them when I popped into VS in Copenhagen. I am gonna save them and take them to America with me!! OGX products are just fab aren't they! Great post lovely. I wish I had a holiday booked for this summer hehe! I definitely agree that the Irresistible Me brush is the perfect thing for travelling, much sturdier than a pair of regular straighteners! 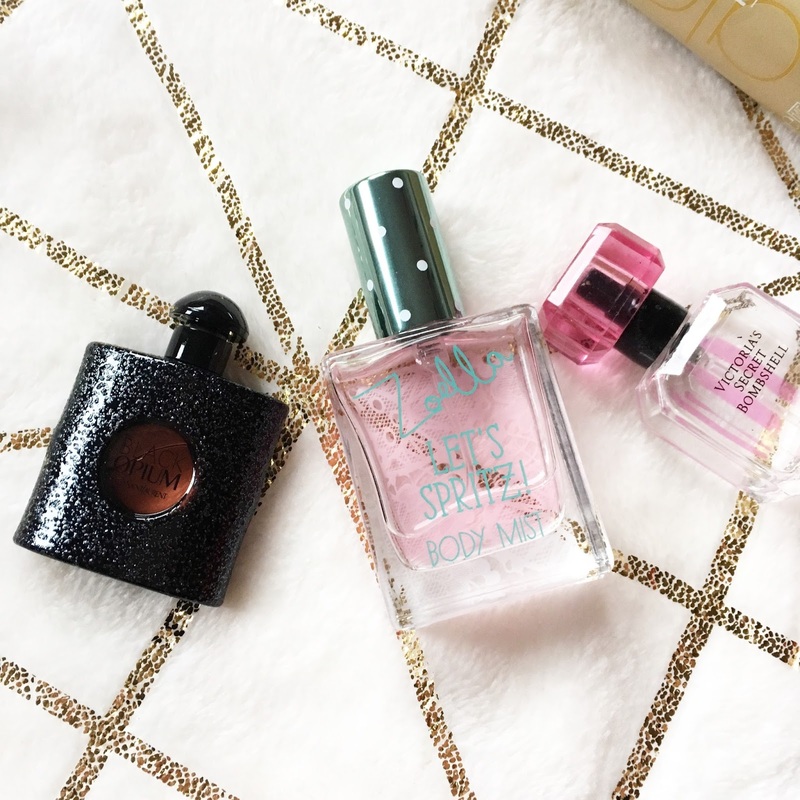 The Zoella body mist smells divine, I'm not surprised that's on your list! Thank you for sharing, Emma! I love looking at all the mini travel size products! I don't get to travel a whole lot so I love looking at posts like this for when I get to travel more. I looooove the OGX minis for travelling & can't ever go without some Zoella Beauty spritz, fave! xo. This post is so helpful - I'm going away for a couple of days next month so I needed some inspiration of what to take! Great post lovely! I don't care what anyone says, I love reading 'what's in my bag?' posts, whether they're handbags, travel or uni bags! We have pretty much the same list of essentials apart from the straightening brush! I find travel-sized products super cute! I have so many Liz Earle minis it's almost a joke. Travelling is always a great way to actually realise your favourites. I always struggle when it comes to packing. Heard so much about OGX products but haven't tried then, will need to give them a go. I love posts like this....i'm so nosy! I love minis and I always take the OGX minis away with me because they're so handy and so good! Some great products here, i love the emma hardie balm! I hear so many good things about that shampoo and conditioner, but I have yet to try! I'm such a nosey person so I love seeing what everyone takes away with them! Minis are perfect for little getaways aren't they?! ah I go on holiday next month to Spain and have a list as long as my arm of toiletries etc which I need to buy! YSL black opium is a must, its me fave scent atm and I'll be sure to pick another up in Duty Free!